My first smart phone was an iPhone 3G. While on AT&T I was loaned a Nexus One (Google’s Android phone) and tested it out to get my first chance to compare Android to iOS. As I wrote about this previously, I felt that Android still has some catching up to do before it provides the same seamless experience. I finally decided to upgrade to a new phone when moving to Verizon’s network earlier this year. 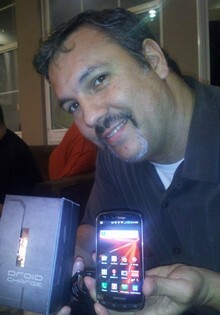 I struggled on whether to get an iPhone 4 or wait for the upcoming crop of Android phones on Verizon’s LTE network. Well I couldn’t wait so ended up getting the iPhone 4. This week I was given the opportunity to test out the new Samsung Droid Charge [Disclosure: I’m being given one to keep] which is their first entry on Verizon’s LTE (4g) network. I was very excited to read this favorable review over at Slashgear on the day I was to pick it up. When I finally got one in my hands the first impression that smacks you on the head is the beautiful 4.3″ Super AMOLED Plus display which is the same one they use on their new Galaxy S II. I know that this is either a plus or minus depending on personal needs, but this is my biggest complaint with the iPhone. How could Apple double the resolution of the iPhone’s display and not increase the screen size? It’s not just about having some more real estate, but I have some big hands and I can type much more comfortable on the Samsung. The image produced by the display is stunning and viewing photos and videos are gorgeous on it. The next biggest feature difference on the Samsung vs. my iPhone is LTE. In the short time I’ve been able to test it thus far I can tell you that the speed is nothing short of awesome. It reminds me of the first time I upgraded from DSL to Cable. The speed at which apps that connect to the network and the browser operates is addictingly fast. Not only do you get that speed out of the phone, but you can also create a mobile hotspot to share that fat pipe or even tether to your computer to tap it. I get impatient now and it feels so slow when I revert back to the iPhone. The iPhone 5 better offer 4G on either AT&T or Verizon because it will be a huge handicap and seem antiquated out of the box without it. I feel that the Samsung Droid Charge’s screen size and speed on Verizon’s LTE network are the 2 major standout features when comparing this to my iPhone without even getting into any of the Android vs. iOS differences. I feel these 2 issues require serious merit in general if considering a new phone on Verizon or anyone else’s network for that matter. Beyond those two clear distinctions I’m also re-evaluating Android from my last experience with the Nexus one. Unfortunately the phone is running Android 2.2 Froyo and not the newer 2.3 Gingerbread. I do like the Samsung TouchWiz UI which doesn’t get in the way and works better than the app scrolling on the Nexus. The built-in cameras (both front and rear facing) seem pretty good although I haven’t A/B’d them to the iPhone. I also like all the built in photo effects available natively in the OS, especially the panorama mode (see below). Another huge plus is the native android ability to share photos from the camera app or gallery to other apps like Twitter, Facebook, Picplz, Seesmic, Tweetdeck and others. I wish that iOS had this feature. The other feature I need to investigate more is AllShare which on the surface seems like Android’s answer to iOS’s Airplay. One of the biggest concerns having both the 4.3″ display and using the LTE network is battery life. Since I’ve only had the phone for 2 days I don’t have enough experience to comment much on this except that I haven’t noticed it to be terrible. Day one I ran out at the end of the day and on day two I still had 26% left at midnight but in both cases my usage was moderate and didn’t involve heavy usage of the mobile hotspot which I’ve read is a battery killer. So I still have some more testing to do and need to see if some of the Android issues that have bothered me in the past have been improved or overcome but overall I’ve been very happy with this phone. My goal will be to see if I can upgrade my Verizon plan to add LTE and Hotpotting so that it can support my usage of both the iPhone and Samsung Droid Charge simultaneously on one plan. That way I can switch between both phones as my daily usage dictates. We’ll see if that’s possible. How is the LTE reception? 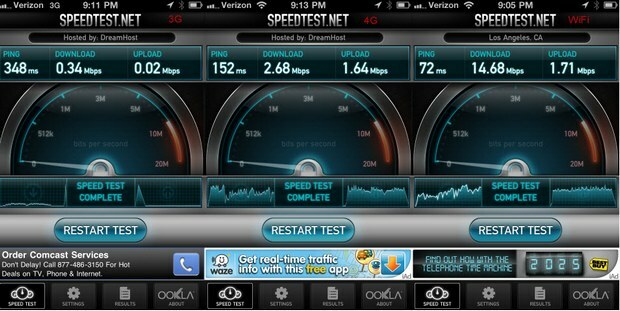 I have Sprint 4g (WiMax), and I love it… when I can get it. Most of LA is covered, but it rarely works indoors, and it’s really patchy in certain areas. Have you had a change to compare the apps? Having never owned an iPhone, I feel like I’m missing out on a few.